If a painting is a movie running on a screen, a sculpture is a drama playing on a stage. Sculpture gives an audience and the artist more directions to evaluate. The audience can go inside a sculpture or come out of it to look at it. The artist’s message is a key for the audience to open their own door to experience the sculpture in 360 degrees. Sometimes, the audience will become part of a sculpture or participate in it. There is no limitation of the imagination of what a sculpture means to each individual audience. Sometimes, the imagination can pass through the timeline to see the elements from a different time or space. Is our home a place of refuge from the outside world? But what if the world was our home, where is the refuge then? Applying this idea of home, as described above in the quote from Gill Perry’s ‘Dream Houses: Installations and the Home’, but to the Earth, rather than a building, invites a new perspective on our custodial duties. The Earth is home not only to us but also to many other organisms – it provides the right elements: atmosphere, temperature, sustenance and time, for us to prosper. Sustaining a world with a sense of equilibrium towards these fundamentals and appreciating the interconnectedness of them all is vital for our home to flourish. One of my new sculptures ‘Home: 3 bed semi’ is created from three rusty beds I found washed up on the beach. The waves had ravaged the upholstery leaving a tangled web of rusting and flaking metal armatures. Salvaged, the beds were crushed and compacted into a cuboid by a baling machine normally used for condensing old metal cans into bales ready for recycling. The spirit of the springs, now largely tamed, was further restrained to prevent the metal’s memory returning. Five fragile birds nests rescued from local hedges in mid-winter adorn the ‘bed’ and remind us that a shelter is temporary if not nurtured. The coming into being of ‘Home: 3 bed semi’. Lately, there has been much publicity about the concern over the killing of exotic wildlife for animal parts that fetch higher values than gold or heroin. In The Guardian on Saturday John Scanlon, secretary general of the Convention on International Trade in Endangered Species (CITES), spoke of the need to have harsher penalties for criminals involved in this lucrative trade. The consequences are devastating for both the wildlife and people. In 1979 1.3 million elephants roamed the planet, now that number has been slashed to about 400,000 as the demand for ivory, mainly from the Chinese, continues. The ban on ivory trading was enforced in 1990 but with little impact as crime syndicates and rebel militia moved in to ‘organise’ the slaughter. Paradoxically, the USA is joined by China at the summit in asking for the trade in turtles to be restricted to contain the decimation of the turtle population. In Asia turtles are popular as pets or as food, particularly vulnerable are eight soft shell species and thirty freshwater species. Other critical issues are the hunting of polar bears for pelts – only 20,000 bears are estimated to be left, primarily in Canada, which is also the only country that permits the slaughter, and the killing of rhinos in Africa for trophies. 745 rhinos were shot for their horns in 2012 – the horns fetch high black-market prices in Vietnam. CITES officials have surprisingly said, that if managed legally the culling of rhinos could offer a sustainable option for conservation of the species. Here’s the link to find out more about the ground breaking ban agreed at CITES on 3 March where Thailand said it would ban its ivory trade. WWF sent out a petition and 1.4 million of us signed it and it actually made a difference. Let’s all look deeper and maybe we could recover the relationship of mutualism. In the news this week architects revealed their latest designs of homes for the future. Arup envisage buildings no longer as passive cells but more as a towering reactive organism complete with their own brains, skin and nervous system. Sounds strange on one level, but considering the advances in building technology, it is a logical development. Arup’s concepts include the engineering of the building’s facilities to respond to its inhabitants and the environment. The design harnesses algae as a biofuel as one power source, (scientists in Berlin are already investigating this notion), and photovoltaic paint as another – by catching the power of the sun. A specialist membrane on the walls converts carbon dioxide back into oxygen. The tower block would also include an integral health and community centre plus shops. There were also transporter pods that attached to the building like a game of Jenga. This is all very futuristic, with some dynamic concepts worth developing, but as most of us hate tower blocks why build more? The photographs below I took in 2012 when I was on a research visit to Chengdu. The Chinese have many sparkling new tower blocks on the main drags through their fast growing cities, but walk down a side street and turn a corner, and you find a different view of tower blocks. Ever wondered what is inside your tv or computer? Rare earths? Firstly, the name is a misnomer as they are not rare, but abundant -just difficult, and therefore costly, to extract. Rare earths are highly valued as they provide essential material for all the electronic gadgets we prize: the laptop I am writing this blog on, the phone I have just used, the television I watched last night and so on. Most rare earths sit in the lanthanide section of the Periodic Table, gradually gaining attention as more countries realise the potential and significance of these elements. The growth and prosperity of a nation partly rests on the key resources it has or can get access to either through leverage or money. Between 2008 -11 China exported around 90% of its rare earths. In 2011 China reassessed its position, and understanding that the finite supply of these precious materials would put it in a vulnerable position if it ran out, now only ships out 50%. At the same time the USA resented China’s grip on the market and their spiralling charges, and reopened some of their mines. The European strategy is to salvage rare earth metals and reuse them. This month I visited Recycling Lives in Preston (all photos here are taken on the visit), one of the leading companies in the recovery and recycling of electronic goods. Waste Electrical and Electronic Equipment (WEEE) is the largest growing waste stream in the EU. Recycling Lives alone recycle 150-200,000 televisions every year. If the machines still work they are refurbished and sold on supporting the waste hierarchy of re-use. But all the redundant ‘fat’, plasma and LCD televisions are there alongside outmoded laptops and broken computers. It’s an amazing and startling sight: hundreds of televisions tumbling out of lorries, black and grey with the odd pink and green case vying for attention. Long benches of people systematically stripping the machines down to their constituent parts: working like machines on machines. Bales of grey and black plastic stacked high waiting to be sent to the polymer recycler for chipping, screen glass is crushed and recycled, circuit boards are graded and stored, metals are salvaged with copper, a prized treasure, being scrupulously saved. Initially, this captures a wonderful scene of a modern nation sensibly managing its waste, and it is, but there is a dark side. Inside our favourite gadgets are dangerous materials that are difficult and expensive to safely dispose off. To handle this at Recycling Lives there are sealed areas in the warehouse that ‘manage’ the toxic substances present in all the electronic goods. Highly protected in specialist gear the workers remove and contain the hazardous materials such as phosphorus. It is then put into barrels and processed at a purpose built facility. To reduce both the level of hazardous waste and the costs incurred in safely handling it, it was agreed in Brussels only last month that LED bulbs should replace the phosphorus ones – LEDs do not contain mercury. Each of us generates around 3.3 tonnes of WEEE in a lifetime and globally we create 50 million tonnes annually. The screens have captured both our attention and documented our lives and the aggregate of that engagement is visible in the huge piles of WEEE littered around the globe. ≈ Comments Off on More or Less? Biodiversity is threatened today by the increase in monoculture, overfishing, habitat loss, pollution and climate change. The Earth has experienced five episodes of mass extinction previously, and now we are in the sixth. Experts estimate that 50% of food varieties and around 8000 types of livestock have disappeared in the last century. There are 1600 species either extinct or currently endangered. Biodiversity is important because it spreads risk whilst adopting monocultures heightens risk. When disease, climate change or natural disasters decimate a species, monoculture offers limited options to find alternatives. Nurturing a bio-diverse ecosystem means that there are a bigger variety of strains of species available to select from when the unexpected happens. Pandas are gorgeous – wide-eyed, fluffy, and docile – just the sort of animal we enjoy anthropomorphising. When I was five all I wanted was a toy panda to cuddle, luckily Santa delivered a giant one, and he became a favourite toy throughout my childhood. When my first son was born a friend made him a toy panda. So we grow up with pandas as lovable bears we want to hug – a cute and friendly animal that acts as great emotional tug plug for the Worldwide Fund for Nature. But what about the pandas – what do they want? Pandas do not possess a strong instinct to procreate, giving birth is a perilous experience for the young cub, coupled with the mothers initially struggle to nurture their young. So why are we spending millions on protecting them from extinction? Should the resources be spent on protecting other organisms that have a greater value to the planet? I visited the Chengdu Giant Panda Breeding Research Foundation last year – a difficult experience as I struggle to watch any animal in captivity even for conservation purposes – the cage is an alien concept. The centre is beautifully landscaped with drifting swathes of bamboo gracing every bank (pandas diet is 99% bamboo) and I have no doubt the pandas are well cared for. I watched some videos of the centre’s breeding programme and gingerly joined the others gawping at the lethargic bears languishing in the trees. It’s an unsettling place especially after reading the book ‘Do We Need Pandas? The uncomfortable truth about biodiversity.’ by scientist Dr Ken Thompson. ≈ Comments Off on Are you sitting comfortably? “It isn’t so much as what’s on the table that matters as what’s on the chairs”. The chair has long been a metaphor for the human and many artists have utilised this motif to great effect. It is a powerful symbol I return to often in my work, its accessibility makes it a favourite with many. I am currently working on remnants of a broken and battered wooden chair that I found washed up on the beach – its shabby paint and distorted form is alluring. The assemblage is going to appear to be walking into the wall with flies crawling up one side of the back – I am thinking of calling it ‘Inertia’. Trying to capture the mood of isolation of abandoned chairs, and the spirit of the location where I discovered them, has been a photographic passion for the last nine years. The photograph above was taken in Dujiangyan, China in June 2012. As I walked along a busy dual carriageway, that bypassed the city, dilapidated warehousing littered the perimeters, I spied this old, battered and poorly mended seat alone in the middle of a deserted pavement – discarded? As I raised my camera, from nowhere an old woman grabbed the chair out of view. You can just see her hand appearing in the left of the shot as I frantically pressed the button. ‘The Pink Sofa in the Fog’ image above has been widely exhibited and appreciated. It was selected for publication in ‘Volume’ arts magazine to accompany a poem. Taken in Morecambe, Lancashire in 2008, on a foggy day, it evokes the dismal ambiance of the town that day. Dirty power news – interesting article worth reading. 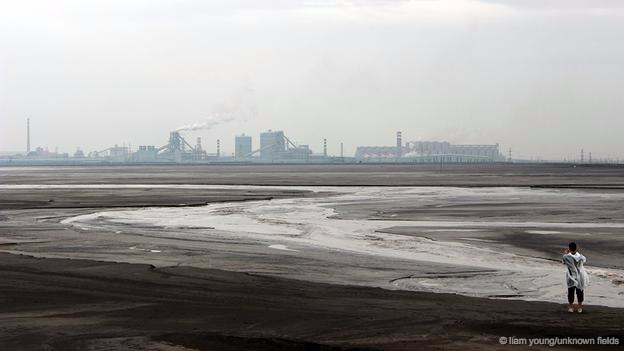 I took this photograph in China, from a coach window, as we sped past one of the many new coal fired power stations. It’s not a great photograph but its value is the irony of a rubbish picker cleaning the highway nearby – a seriously dangerous and dirty job. If there is only the real truth to an individual, rather than a divine/ultimate truth, then the writing of history is always a re-writing of history, no matter who or what you are? Agree?